There’s a growing fashion to remove broken rubber bands by using the pullup cord to “cut”them off using friction. It’s fast way to do the job, but unfortunately most of the time the tape gets damaged as well. 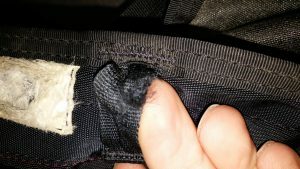 Repairs like this cost money, so think twice before you choose to do it the next time!! !